whereas plants with very large leaves tend to indicate much wetter environments. whereas those with smooth edges tend to indicate regions of hotter climates. These observations would most likely hold true within ancient environments as well as those within modern environments. Only a portion of the slab is shown. 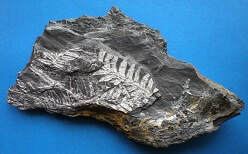 Glossopteris provided early clues for what was known at the time as "continental drift". An incredible specimen! Only a portion of the slab is shown. Specimen is ~ 75% complete. Complete broad-leafed specimens are rare and very expensive. Replica of a portion of the interior of a calamite tree. Dawn Redwood. Mazon Creek, IL, formation. Includes only one of its two halves. Only a portion of the slab is shown. Nearly identical to those of the Metasequoia. ~ 1" in diameter.